UK data analytics firm Cambridge Analytica, whose HQ is a stone's throw from the buzz of Covent Garden in London, England, is on the hunt for a data protection assistant. The London offices are close to the British Museum and many iconic landmarks, so if you enjoy the sort of high-profile workplace that tech wunderkind Mark Zuckerberg can't stop talking about, you're in luck. The position for a data protection assistant – which eagle-eyed Reg reader Steve Jones brought to our attention – was no doubt planned when the business thought its biggest problem would be complying with the impending General Data Protection Regulation. 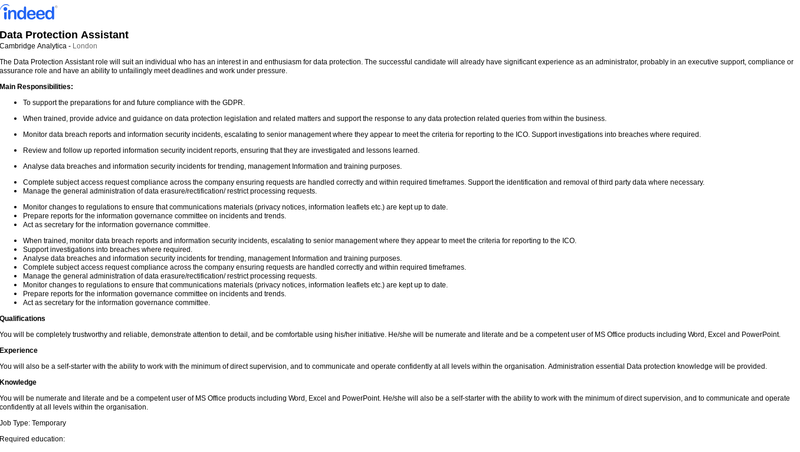 Among the main responsibilities listed in the ad (and screenshot here) are to "provide advice and guidance on data protection legislation" and "support the response to any data protection related queries from within the business". As the applicant is also expected to deal with subject access requests – where people can ask companies to say what information they hold on them – and manage data erasure, rectification and restrict processing requests, El Reg suspects this might be a very hectic job. Other requirements are to "review and follow up reported information security incident reports, ensuring that they are investigated and lessons learned" and "analyse data breaches and information security incidents". Those interested in swotting up on their potential employer may find we've written a little about it over the past few days. See here, here and here.